Get involved! Join one or more of the CEMS clubs, organizations and academic honor societies listed below. Participation in organizations on campus can help you to explore new interests, meet new people, develop leadership skills, supplement your career preparation, and have a lot of fun! Here is a partial list of active groups with contact information. If you have questions, please write to the individual groups or CEMS Student Services at cems.student.services@uvm.edu. AERO is a team that designs and builds open wheel electric racecars to compete at an international collegiate competition. We welcome all majors and no prior knowledge or experience is needed. Stop by our shop (Votey 118), check out the AERO website, or get in touch with us at uvmaero@gmail.com to learn more. ASCE is a club dedicated to the professional development of student members. Our goal is to integrate the student chapter into the professional engineering society. We strive to provide a productive and fun environment by offering site visits, guest speakers, social activities, involvement in engineering competitions, and the opportunity to work on engineering projects for the betterment of the community. We have the opportunity to compete in one of the biggest and most renowned engineering competitions in the nation: The AISC/ASCE National Student Steel Bridge Competition. The club designs, analyzes, and fabricates a steel bridge customized to a specific set of rules each year. We travel to compete against numerous universities throughout New England. Normal meetings occur Tuesday evenings at 7PM in Votey 207. Specific steel bridge design meetings occur Thursday evenings at 6PM in Votey 206. The American Society of Mechanical Engineers is an academic club at the University of Vermont that aspires to create the best community possible for engineering students. In order to do so we work hard to bring mechanical engineering outside the classroom. We host professors, company leaders, and more to give professional talks about their personal experience and allow them to share their engineering knowledge. In addition to networking and communicating with professors and companies, we go on tours of engineering facilities such as Burton and General Dynamics. One of the greatest opportunities for ASME members is the international competition called the Human Powered Vehicle Competition, which is hosted by the national chapter of ASME at an event called E-Fest. Last year was the first year we attended, and we worked hard to design a vehicle from scratch using software such as Solidworks and then fabricated the entire vehicle ourselves. We were able to place 17th overall competing against over 50 other teams. Meetings for the HPVC are Wednesdays at 7 in Votey 207/209, anyone is welcome! 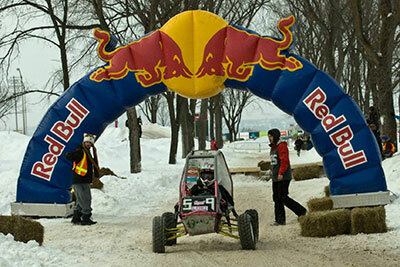 Baja is an international collegiate competition series hosted by the Society of Automotive Engineers. Each event consists of several competitive trials which are tailored to challenge college teams to build the best, quickest, most affordable and safest off-road vehicle. 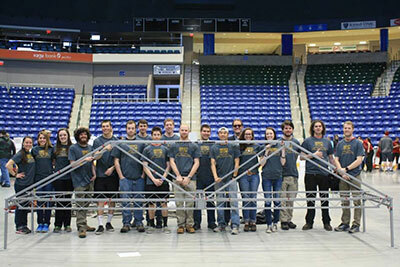 This year, the UVM Baja SAE club is fabricating an entirely new frame and suspension package. The team will bring the new 2015-2016 Baja to Tennessee Tech in April to compete against 99 other schools in several dynamic trials, a design competition, and a four hour endurance race. The meeting times vary depending on the assigned project group. Please email if interested. The club aims to be a resource for innovation, student networking opportunities, and community outreach in the field of biomedical engineering. The primary purpose of the Biomedical Engineering Society (BMES) will be to build and maintain a community of students with a common interest in the field of biomedical engineering. The society will organize events to provide its members with opportunities to engage with the larger Burlington community through outreach projects and volunteering efforts. The society will provide the opportunity to participate in a design competition where members can showcase and practice their innovation skills outside of a classroom or research setting. The society will also further garner interest in the field of Biomedical Engineering to UVM students by organizing on campus talks. 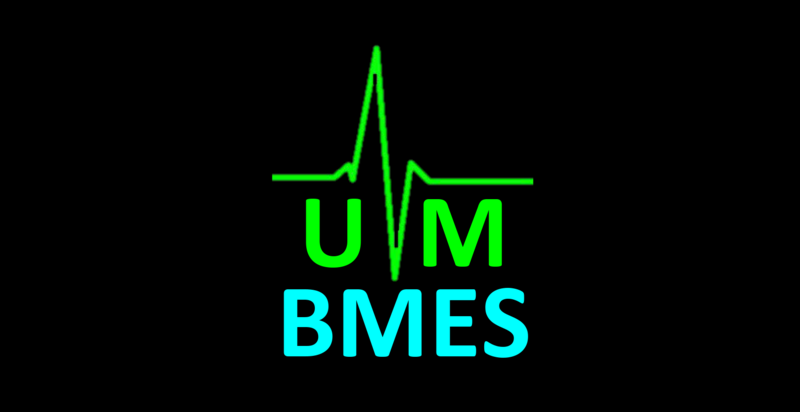 Lastly, BMES will facilitate networking for students by sending them to the nationwide annual BMES conference to represent UVM and in some cases to present their successes. 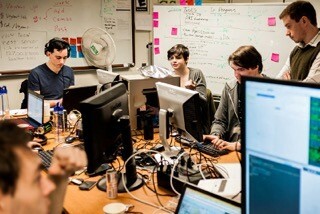 The CS Crew is a student-led community of individuals studying or interested in Computer Science at the University of Vermont. Founded in 2010 by Anthony Sweet, Mark Cooper, and Beau Cameron, they provide a space for students to further their knowledge and skills in CS related concepts and applications. The Crew Room is located in Perkins 202 and members welcome anyone who wants to come in to work on projects, get help during help hours, study, and network. Meetings are bi-weekly in Votey 207 alternating with SWiCS. The UVM chapter of Engineers Without Borders is one of many chapters in the United States. Engineers Without Borders USA supports community-driven development programs worldwide by collaborating with local partners to design and implement sustainable engineering projects, while creating transformative experiences and responsible leaders. We feel that everyone has the right to the fundamental necessities of life. Our goal is to use our knowledge and creativity to work with developing communities to overcome the barriers preventing them from obtaining these basic needs. EWB-UVM is currently working on a grey water filtration system in Venecia, Nicaragua. The goal is to create a system to reuse the village's grey water to water their home gardens. EWB-UVM took their first assessment trip in May 2014 and are planning on another trip in Spring 2015. The club is currently building its first prototype of the filtration system and is looking forward to testing it out. In addition to our main project, EWB-UVM hosts workshops, attends national conferences, and tours local engineering companies. 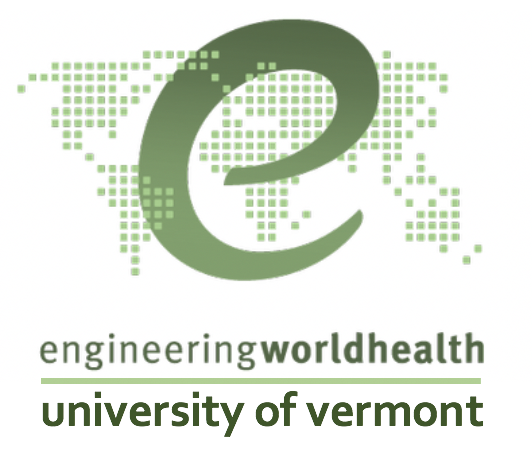 EWB-UVM is closely connected with the Burlington Professional Chapter of EWB and provides great opportunities for networking with local professional engineers. The UVM IEEE Club engages students in skill-building activities, both technical and career-developing, to prepare them for the professional working environment. IEEE holds various workshops throughout the year based on member input and participates in IEEE competitions like Micro-Mouse and the IEEE Ethics competition. IEEE is currently working on building an octo-copter to complement their recently acquired quad-, tri-, and hexa-copters. IEEE also works with faculty advisers, local professionals, and the UVM Career Center to develop its members professionally. They host the annual Student Professional Awareness Conference (SPAC), a networking event which brings together students, representatives from companies, guest speakers, and the UVM Career Center. They also partner with the local IEEE Green Mountain Section to conduct a lecture series throughout the year so that students can learn about ways in which they can apply their Electrical Engineering degree. 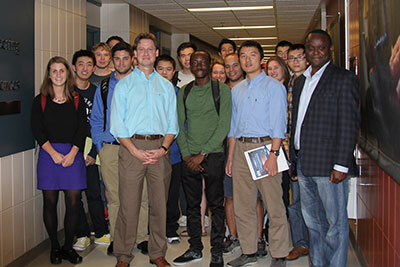 UVM IEEE is advised by Professor Hamid Ossareh and led by Jon Hart (President). Math Club was created to foster a community of people who are interested in math and math-related fields through fun activities and interesting lectures relating to math. We welcome anyone who loves math or wants to learn more about math. 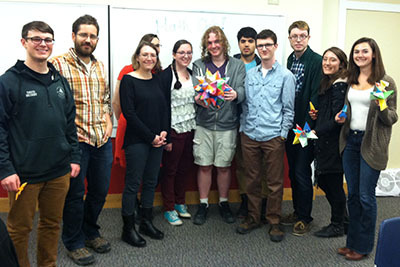 Some example events include origami, guest lecturers, and math-related movies. Our activities can be best described as math related or adjacent, such as lectures on graph theory or math scavenger hunts. We meet every week during the semester. Please contact us or check our website for meeting times. Visit our club site at http://www.uvm.edu/~mathclub/. Our goals are “to stimulate and develop student interest in engineering; to strive to promote participation at all levels of responsibility in the field of engineering by the black communities; and to endeavor in the advancement of black professional engineers within the individual engineering disciplines.” The organization will emphasize engineering through a social justice lens and be a space for all people of color and white-identified allies. The organization will plan events relating to the above statements within the University of Vermont campus community as well the Greater Vermont community. The Society of Women Engineers (SWE) is a global organization created to provide women engineers with the resources and support to achieve their full potential as leaders in their profession. The student and professional chapters of SWE work together in hosting networking events, resume workshops, and other activities to strengthen our professional prowess. We also host fun community events such as apple picking and volunteer with local groups such as the Girl Scouts and Vermont Works for Women. Membership is open to students of all gender orientations with interests in engineering, science, math, and technology. Our goal is to create an environment where students can meet other women in Computer Science and support each other, share ideas of opportunities involving CS, and offer advice on how to excel in the courses and field of CS. Our mission is to provide opportunities for professional and social development in the CS field. We also want to fund and offer women in the field of computer science the opportunity to attend educational and professional conferences. Every year we will choose a different project that will help out the community, whether that be the Computer Science community or the Vermont community. We also hope to provide mentorship and support for women entering this field in order to provide a sense of community. We hope that this group will serve as an informational and social network of individuals interested in computer science. 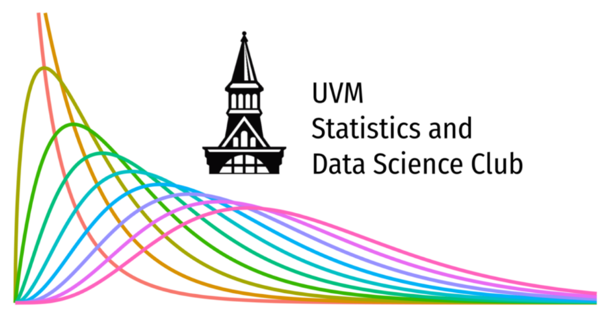 The UVM Statistics and Data Science Club welcomes all who share a love for numbers, data, and data visualization. The club is a place to convene with other students in the same majors/minors taking the same courses. Meetings include presentations of famous statisticians or material, fun games, student opportunities, conferences, etc. We also convene with the Math Club for joint events. Check out our website, where you will find the calendar of events, useful links and a blog of past meetings. Founded in 1885, Tau Beta Pi is the nation's oldest and largest engineering honor society. 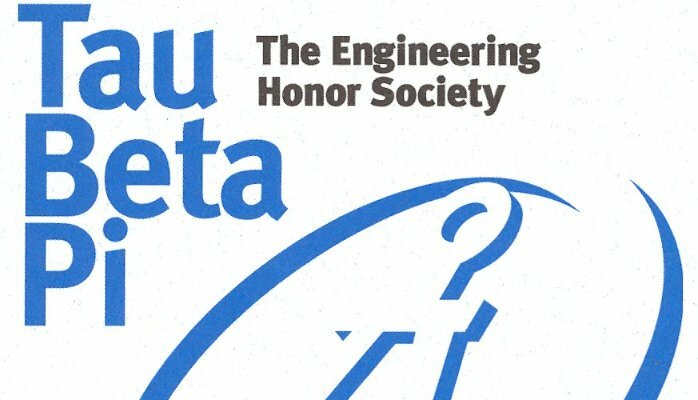 Membership in Tau Beta Pi recognizes exceptional engineers and students who have exemplary character and also offers unique and valuable opportunities. Tau Beta Pi seeks to broaden the collegiate experience of its members, thereby enhancing the engineering educational experience. Interests in non-technical fields, civic responsibility, and other human and cultural areas are encouraged through the various social and service activities of the chapters. Membership in Tau Beta Pi enables close interaction with students of all different engineering disciplines within your school and also provides opportunities to interact with faculty members, many of whom are also Tau Bates. Tau Beta Pi assists more students than any other engineering organization, awarding more than $300,000 in scholarships and at least $80,000 in fellowships each year. The UVM chapter of Tau Beta Pi is VT-Alpha. You are invited to join TBP you’re junior and senior year at UVM based on academics and character. We perform various service events around the Burlington community and on-campus. We also host professional development series from renowned motivational and professional speakers. Be sure to find us on campus for “Pi” Day activities in March too. We’re are looking forward to 3.1415 this year!